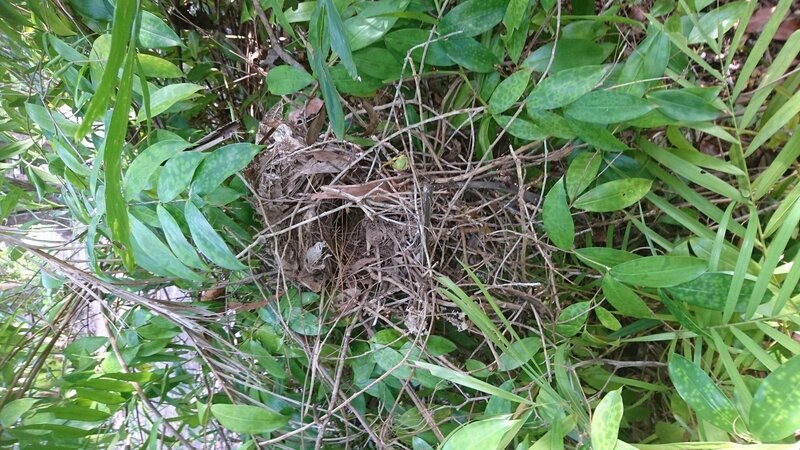 The Land for Wildlife Top End was successful in receiving a grant from the NT Government’s Department of Environment and Natural resources to carry out a project to allow landholders in the program to monitor wildlife using nest boxes that have been installed for arboreal mammals. With this grant we have purchased 12 motion sensing cameras, and a further 6 with our own funds. These are the Reconyx Hyperfire 2 newly released model! We have been working with RIEL scientist Leigh-Ann Woolley to choose the best cameras and set up, to record nest box use and arboreal mammals and develop a citizen science style project. The project aims to engage landholders and allow them to know more about arboreal mammals on their property but also add to data and understanding of nest box use and mammal presence in the Top End. We will lend the cameras in rounds, 3 months at a time to landholders that have installed nest boxes. Once we have captured photographs from the cameras we will have an intern opportunity for a university student to collate and interpret data. After the first year we will have the cameras as an asset to our program which can be lent to landholders to monitor targeted wildlife species in different ways. We invited our first group of landholders to a workshop at Riyala in Noonamah to learn about how to install and use the cameras. We were joined by both Leigh-Ann Woolley and Jenni Risler, who have been studying the Black-footed Tree-rat. Leigh-Ann specifically has been studying nest box use on Coburg Peninsular and helped come up with bracket designs to hold cameras by nest box entrances. Jenni is has been researching the best camera trapping methods- so the perfect combination of assistance for us and our members! Treenie at Land for Wildlife had made brackets for the cameras, with some landholders keen to try out some other versions. We had a test camera up on one of the boxes at Riyala, to show everyone the installation set up. After just 3 days there was plenty of possum action caught on camera! Landholders will install cameras for 3 months at a time and with assistance check that they are working. Some landholders attended and received new nest boxes and will set up cameras later in the program. Ian Morris, who is one of the land managers at Riyala spent the afternoon showing interested landholders around the property an dhow he had restored areas to rainforest from flogged out pasture land. Here’s hoping that we capture some Black-footed Tree-rats on camera! It’s Threatened Species Day! Here is a wonderful (stylized) painting of the Black-footed Tree-rat which has been gifted to the Land for Wildlife program from local artist Sandra Kendall. These native rats are often mistaken as non natives or it is not known they are threatened. We are lucky that there are quite a few in the Darwin region. If you see these beautiful natives out and about, upload your sighting to Wildwatch! http://root.ala.org.au/bdrs-core/nt-dlrm/home.htm Note the white tip tail! Our newest Land for Wildlife members (today) are long time Territorians: Leonnie and Alan Norrington. They have managed their 20 acre property for nearly 40 years, the majority is wildlife habitat and connects to 8 other LFW members in the area. They also joined up to our Black-footed Tree Rat project and will install 5 nest boxes and then motion sensing cameras to see who is using them. They are also the second new member to recieve a sign with the Black-footed Tree-rat, a threatened species declining from our Top End Landscapes.THANKS to all our members for voluntarily conserving wildlife habitat in the Top End region and helping protect threatened species such as the Black-footed Tree-rat. Exciting new signs now feature the Black-footed Tree-rat. We now have the BFTR featured on our new signs. We hope to promote these beautiful native animals and that they are endangered by incorporating them into our signage and programs for landholders. The scientists at RIEL helped us draw the BFTR, although this is hard to depict exactly on a sign in a simple outline (and yes they are a bit darker) – but look at that tail: how could you not know this cutie! Pictured are our first new members to receive the sign- Emma and her daughter in Mcminns Lagoon who joined up this week. Today 2 exciting things happened- our Reconyx motion sensing cameras arrived. These are to be lent to landholders to really check out if arboreal mammals are using the nest boxes we have out on properties. A workshop will run in August to assist landholders to set them up and collect photos that will hopefully build a better understanding of nest box use. They will be lent to landholders for 8 weeks at a time. Also today we picked up 25 more nest boxes to add to the 150 out there on Land for Wildlife properties. These were made by Palmerston Men’s shed. We are excited to announce that Land for Wildlife Top End is working with Charles Darwin University to assist with re-vegetation projects around the university Casuarina campus that replenish areas as native wildlife habitat. Charles Darwin University are in the process of joining Land for Wildlife as an educational member. This is wonderful news that will create a whole range of opportunities for community engagement, educational collaboration and learning as well as of course habitat protection. The Charles Darwin University campus at Casuarina is in a unique position, nestled into the Casausrina coastal reserve, which covers an area of 13.6 square kms of land. The Casaurina campus is across 2 tenures of land (totaling 58 hectares), the most northerly borders on Mangroves communities of the reserve. The campus includes many university buildings and landscaped gardens but also includes 8 hectares of remnant vegetation. The endangered Black-footed Tree-rats have been recorded in an area of this woodland and research scientists have installed nest boxes to enhance the habitat. In the wet season, the Green Army assisted with planting 800 trees in areas adjacent to the CDU campus that had been cleared of Coffee Bush by the CDU amenities team. Our Green Army team also watered the plants each week once the rain had stopped, until their graduation in May. Now the amenities staff are keeping the areas watered and weed free. Included in these trees was also a planting that was carried out by Conservation Land Management students, as part of their “Restore Natural Habitats unit”. The Land for Wildlife coordinator joined students to give a background to the restoration and enhancement program for the Black-footed Tree-rats in Land for Wildlife. Students will continue to care for the plantings they carried out. More plantings will continue this wet season in previously disturbed areas and a weed management and sustainability on campus plan is being developed by university staff, with consultation with Land for Wildlife. We have been members of Land for Wildlife for nearly 8 years and remain committed to the broad objectives of ‘caring for country’ (aspects of which I shall return to later in this article). Having the sign on our gate is not so much a badge of honour, although we feel privileged to be members; rather, for us at least, it is a statement that we consider wildlife conservation and the protection of habitat to be a responsibility we have in choosing rural residency and lifestyle in the Top End. Not that we would have taken our responsibility any differently had we not joined Land for Wildlife; weed eradication, toad control and general upkeep would have continued as before but shared experience and the enrichment it brings by being members would have been missing. Retirement brings the advantage of more time at home to observe but, paradoxically it seems, less time for upkeep (falling energy levels!). We certainly saw new visitors to our place this year and our bird population was more diverse and greater (with the notable exception of magpie geese). Over the last 10 years or so, a section of our property has hosted hundreds of magpie geese generally from late October until late December which night roost in the tops of mature E.tetradonta and provide the safest spots. Watching them land in flocks at dusk is fun because it resembles a car dodgem show because it inevitably leads to bump offs and much noise. But there were much fewer this year and they left in late November. With the wetter start to build-up this year on top of our third highest annual rainfall last year, I suspect the floodplains have provided an earlier yield of wild rice and Eleocharis for grazing. Amongst the newcomers was a pair of raptors and juvenile (grey wing feathers). One of these magnificent adults is shown in Photo 1 perched on our upstairs verandah rail. 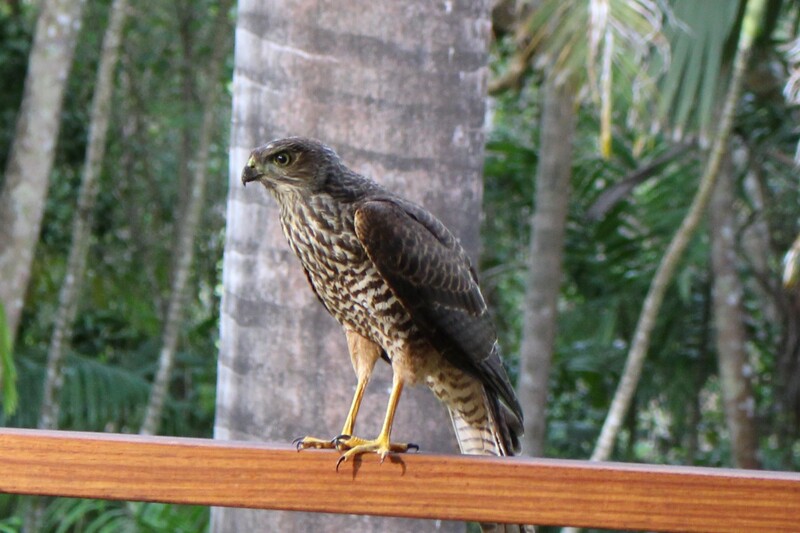 We think it is a Collared Sparrowhawk -can anyone confirm? We have also been delighted to have a nesting pair of Rainbow Pittas for the first time. They seem to like the area around our pool which is densely shaded and has copious leaf litter under the tree canopy where they have built two nests (Photo 2). It’s fun watching them hopping about collect sticks and leaves for nesting with the size of the bundle in their beaks often dwarfing their heads – or is it only the male that collects and builds the nest? – can anyone help? At the bottom of our drive, last month, we saw the arrival of a flock of around 20 Crimson Finches which spent time alternating between pandanus trees and a conveniently located puddle that served as a bird bath. We haven’t seen them for some years, so it was pleasing to have them visit us. Dealing with weeds at near ground level might be relatively straight-forward – albeit hard work and, at times, back-breaking but what if the weed dwarfs all other surrounding trees rising to well over 30 m and throws out suckers which extend as far as 50-100 m from the parent tree. Yes, sounds like a nightmare and it has been with the presence of an African Tulip tree which was planted before we bought our property 20 years ago. 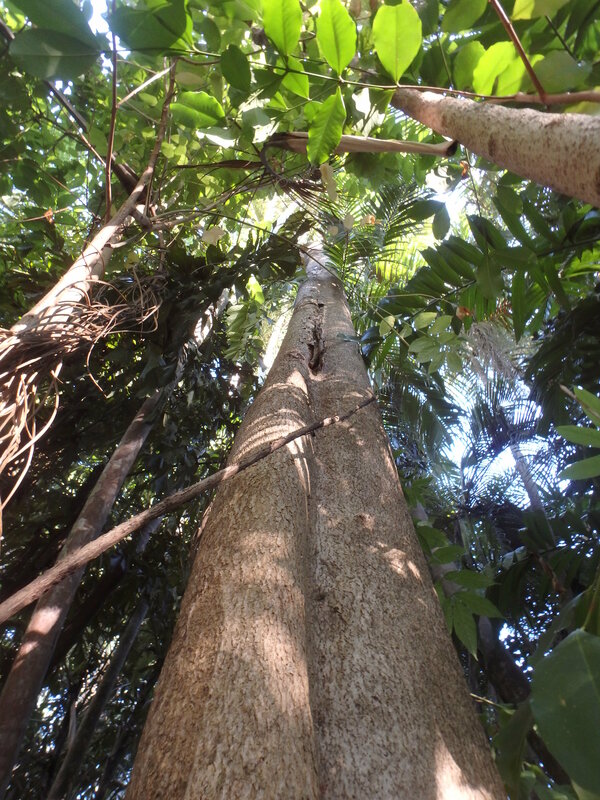 Not only does it have an incredibly high growth rate in the tropics (ie of up to 5cm in trunk diameter/year), their wood is spongey, weak, and prone to break in storms. There are also reports that the pollen of their attractive flowers is poisonous to wild bees. Under Queensland legislation (Biosecurity Act, 2014) the African Tulip tree is classed as a restricted invasive plant. If it has not been banned for sale or planting in the NT, it ought to be. So, this year with time on her hands, we decided to act and were spurned on by meeting the tree surgeons who so aptly demonstrated their skills at the nesting box programme organised by Emma and Land for Wildlife earlier this year. The tree was duly felled in June and it was great to watch these guys working with crampons, rope, and chainsaws. All the wood was retained on site and placed to provide habitat/refuges for wildlife. 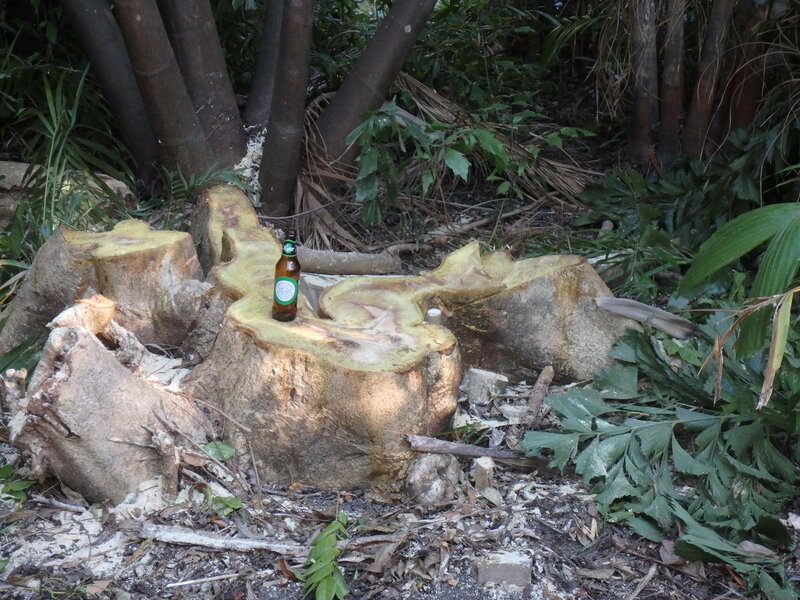 The trunk was sawn to near ground-level and treated with glyphosate which has been successful in killing the root system of the parent tree. Before and after shots are shown in Photos 3 & 4. I am sure I share the sentiments of Land for Wildlife members when I say that I was disappointed to learn about how devastating the fires around the Berry Springs/Darwin River areas were this year and how hard work in establishing and conserving habitat (and nest boxes) can be so easily destroyed and undermined by repeated annual hot fires. It is unacceptable that some members experienced damage to their properties and wildlife conservation by trespass. Likewise, it is intolerable that some cat owners should choose to allow their pets to roam freely with the resulting devastation to wildlife everywhere but especially on neighbouring Land for Wildlifeproperties. Lack of weed control by some land owners continues to cause problems to some of us but also to the greater environment. I do not believe ‘the voice’ in support of wildlife conservation and everything associated with good decision making in land use planning, and sustainable practices in land management, is strong enough. However, I want to quickly add that ‘the voice’ should not come from Land for Wildlife itself, but from us……it needs to be ‘our voice’ as individuals, as an independent group, including non-members who also share our values and objectives. Land for Wildlife, as an organisation relying upon government funding, cannot do that job for us, and must not. I have always been struck by how successful other interest groups such as the fishos and hunters have been, and continue to be, in putting forward their views and in fighting issues that might affect their lifestyles in pursuit of their interests. They gain media time and attention. We simply don’t. So, I would like to propose a meeting of like minds, should they exist! I would be delighted to organise a meeting in February/March 2018 at which we might discuss the concept of self-help and its development, but I suggest we would need a quorum of at least 10 attendees to get the ball rolling. If you are interested, or simply want to comment, please send an email to humptydooer@hotmail.com marked ‘Self-help’ in the message title. Have a great holiday, and all the best in the New Year.